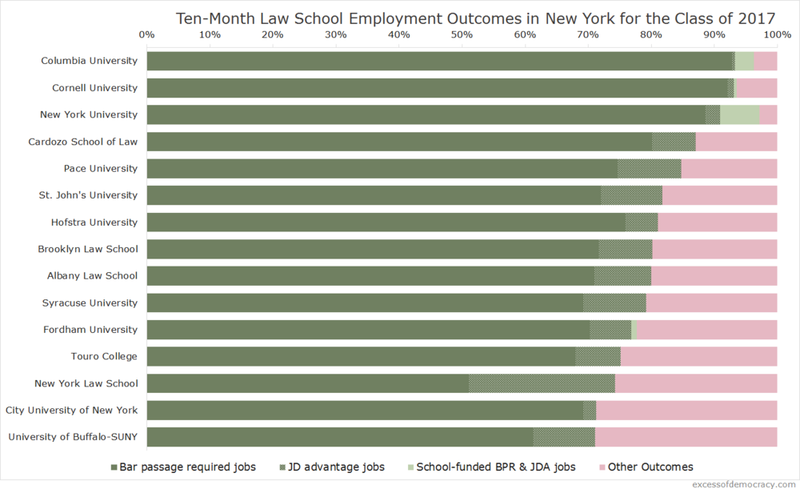 After sharing some big-picture good news about the legal job market for the Class of 2017, I thought I'd share a few details on the market, similar to my report last year. Indeed, the report is very similar to last year's because the trends have accelerated. And outcomes appear to be qualitatively and quantitatively better. I drew comparisons to the Class of 2013 (which, it should be noted, were nine-month figures). 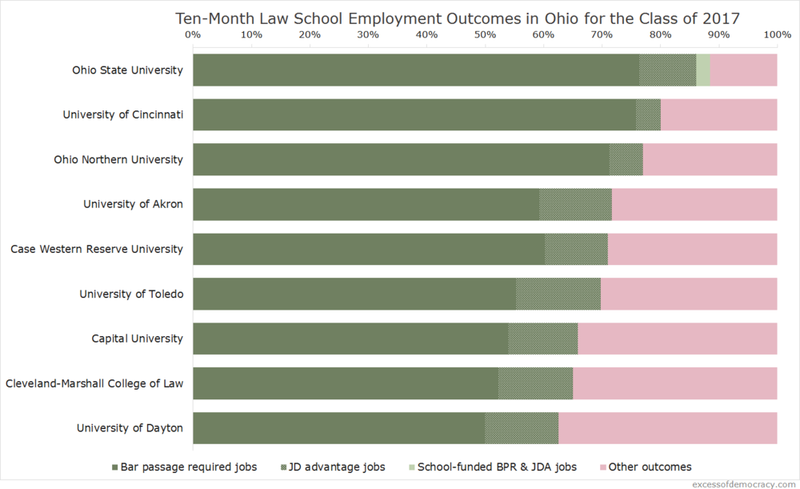 Declines in overall jobs, overall graduates, and bar passage rates assuredly affect some of the industry-specific figures. Last year, I noted that jobs in smaller firms and business and industry were disappearing for entry-level hires. That continues to be the case. 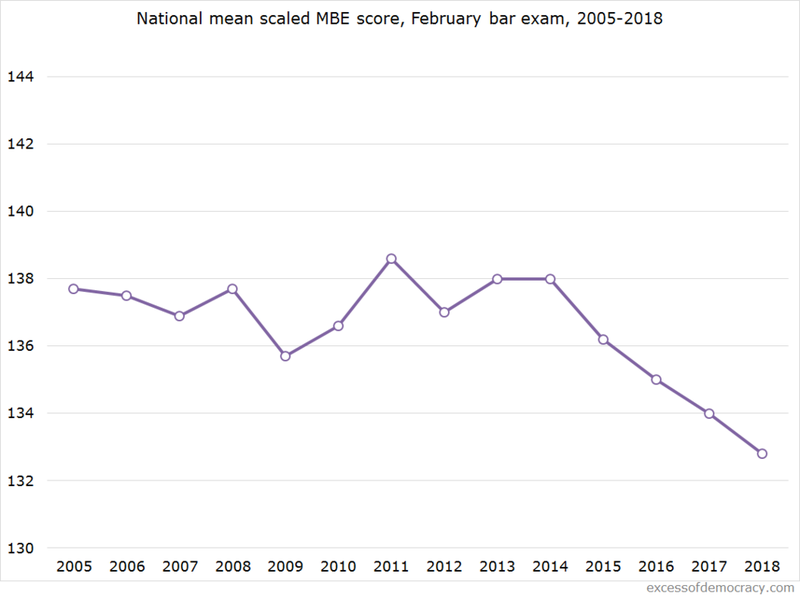 We now know the mean scaled national February MBE score was 132.8, down 1.8 points from last year's 134.0, which was already an all-time record low. We would expect bar exam passing rates to drop in most jurisdictions. On the heels of an uptick in MBE scores last July, the results are particularly troubling. Given how small the February pool is in relation to the July pool, it's hard to draw too many conclusions from the February test-taker pool. That said, the February cohort is historically much weaker than the July cohort, in part because it includes so many who failed in July and retook in February. Without knowing the percentage of repeaters, that would be the first place to look. Another reason might relate to the increase in the July scores. Based on some informed speculation, some schools may have been advising some more at-risk students to delay taking the July exam and instead prepare more for the February exam in hopes of increasing first-time pass rates. If that happened, we may see a skewing in the quality of first-time test-takers in the February cohort, which would result in a decline in scores. That might explain some of the small improvement in July and decline in February. At some point soon, however, we should see a more regular rebound in bar pass rates. The first major drop in bar exam scores was revealed to law schools in late fall 2014. That means the 2014-2015 applicant cycle, to the extent schools took heed of the warning, was a time for them to improve the quality of their incoming classes, leading to some improvement for the class graduating this May of 2018. Of course, these are high-level projections and guesses. School-specific data would be useful. But it surely will not end the debates raging right now about the bar exam, and it will only serve to put more pressure on law schools looking at this July's bar exam. UPDATE: NCBEX has revealed that first-time test-takers were 30% of the pool and saw a smaller decline than repeaters, but the number of repeaters was mostly unchanged. Karen Sloan has more.